A social club in Devon has banned a 77-year-old man from breaking wind while indoors. Maurice Fox received a letter from Kirkham Street Sports and Social Club in Paignton asking him to consider his actions, which "disgusted" members. 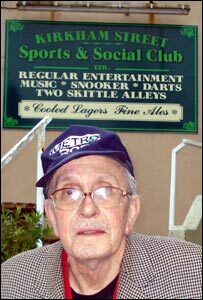 Mr Fox, a club regular for 20 years, said: "I am happy to oblige them, there is no problem. I do get a bit windy - I am an old fart now." He said he had to leave the club about three times a night. In its letter to the retired bus driver, the club said: "After several complaints regarding your continual breaking of wind (farting) while in the club, would you please consider that your actions are considered disgusting to fellow members and visitors. "You sit close to the front door, so would you please go outside when required. So please take heed of this request." Mr Fox, who lives in nearby Princess Street, said the letter was a surprise because he had been given no verbal warning. "I think someone has complained about the noise. I am a loud farter, but there is no smell. "I do not think it [the letter] is unreasonable, you get ladies in there." Mr Fox also spends two days a week at the nearby Palace Place club, but said he had no complaints about flatulence there. The club said there was no one available for comment.